Its location looking onto one of the World's most famous landmarks, makes this - the flagship restaurant in the Thai Square Group - an absolute 'must' for lunch or dinner. The authentic interior decor, featuring beautiful Thai artefacts, and the healthy Thai cuisine ensure a memorable visit to the very heart of London. 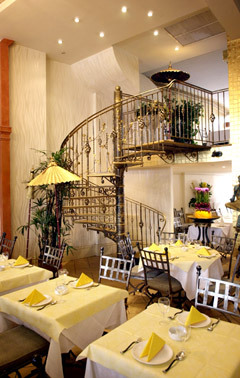 The ambience is designed to create a warm, friendly, authentic Thai atmosphere and succeeds in doing so. The golden exterior complements the authentic interior, which features beautiful Thai artefacts, and a healthy Thai cuisine. The restaurant can get quite lively and vibrant and you will receive a warm greeting - which is part of what makes this spot a favourite among the mixed clientele. Service is good and friendly. With its reasonable prices and lively ambiance Thai Square is a great place to come with either a group of friends or a loved one. There is a Club downstairs which makes this restaurant the perfect one-stop for a lovely evening, so after a delicious diner make your way to the basement and dance the night away, until 3 o�clock. The restaurant seats 200 while the Club has a capacity of 220. There is a beautiful private room named Hong Tok, perfect for groups of about 8. The Chef is from Thailand and his menu features traditional Thai dishes that are low in fat and high in nutrients. The dishes are hot and sharp, rich and complex with exotic herbs blended with essential ingredients freshly flown in daily from Thailand. The menu is extensive with lots of pan-fried dishes, curries, soups, salads and vegetarian options.